The enemy is trying to destroy your mental stability, your peace of mind. You counter-attack by remaining not only clam but cheerfully conscious that the enemy is wasting bombs, wasting petrol, wasting machines, and wasting men, because he has not been able to get you down. 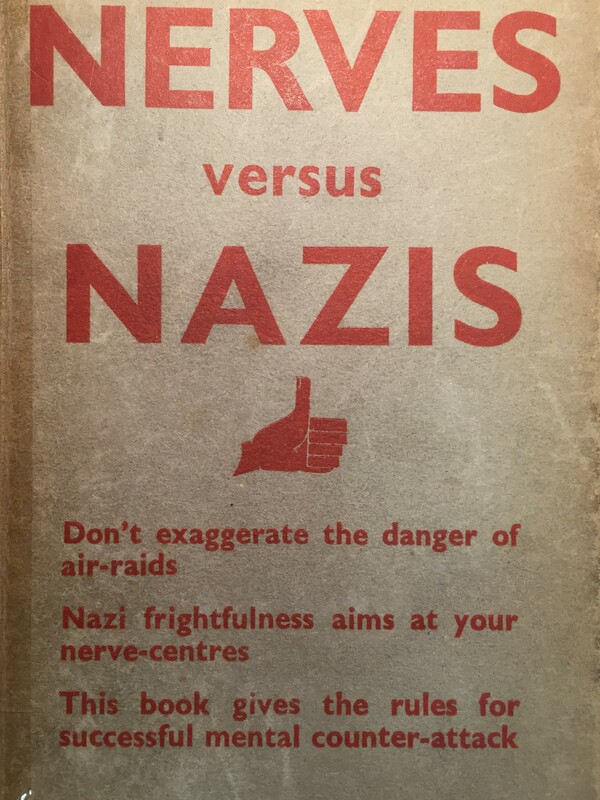 His book is filled with all sorts of useful things that I hadn’t perhaps thought of, particularly on the subject of explosive noise. Hearing a bomb explode is, he explains, likely to be personally good news. The fact that you heard it means that it didn’t kill you, and at the rate which bombs fall out of an aeroplane the next one that lands won’t land near you. It is, of course, possibly not good news for someone else, but this book is practical rather than spiritual in focus. Most explosive noise is also good because it is “our” noise – anti-aircraft fire, barrage, or the noise of emergency response, doing practical things to put things back to how they were. 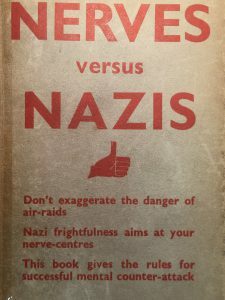 In 1940, I don’t know if I would have found this stiff-upper lip publication a useful read or not, but I think I might find its advice quite useful now in 2018. 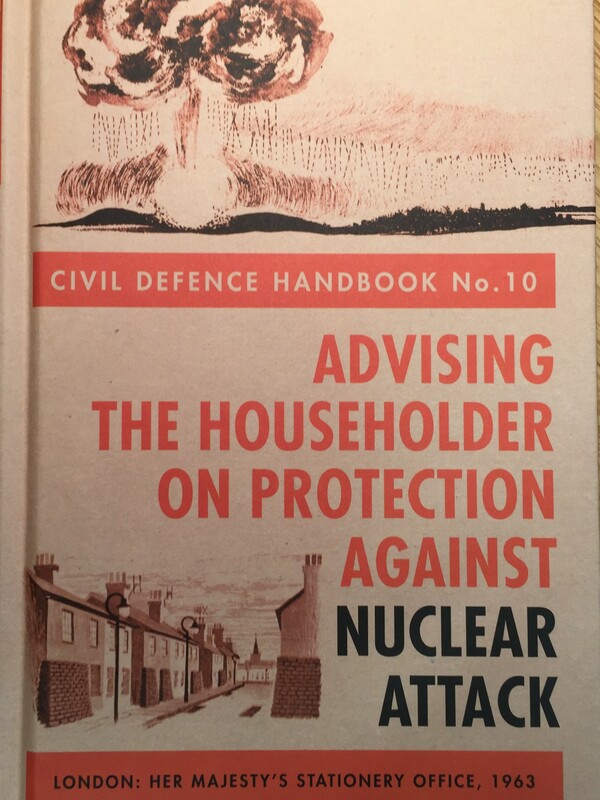 What I don’t think is a helpful publication, in any way whatsoever, is the 1963 HMSO publication Advising the householder on protection against nuclear attack : Civil defence handbook no. 10. Given the central location of where I work, in what I presume is a key target city for any hostile foe, not only do I fully expect to be killed immediately in a nuclear attack, I wouldn’t be at all surprised if the incoming missile actually cleft me in two. 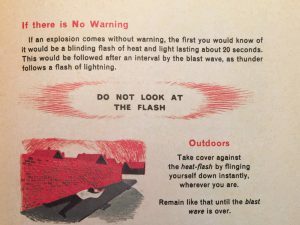 The reality of nuclear bombs is that they create the kinds of temperatures that do not usually occur on this planet and that if you are five or six miles near one then the bits of your body that are made of liquid or contain liquid boil and evaporate immediately. Things that are not made of liquid are then blown apart about 20 seconds later by the epic amounts of displaced air that push out in every direction. For populations that are increasingly urban (even when this was first published), these publications are completely useless. Where the interest in them mostly lies therefore is with regard to their intention. 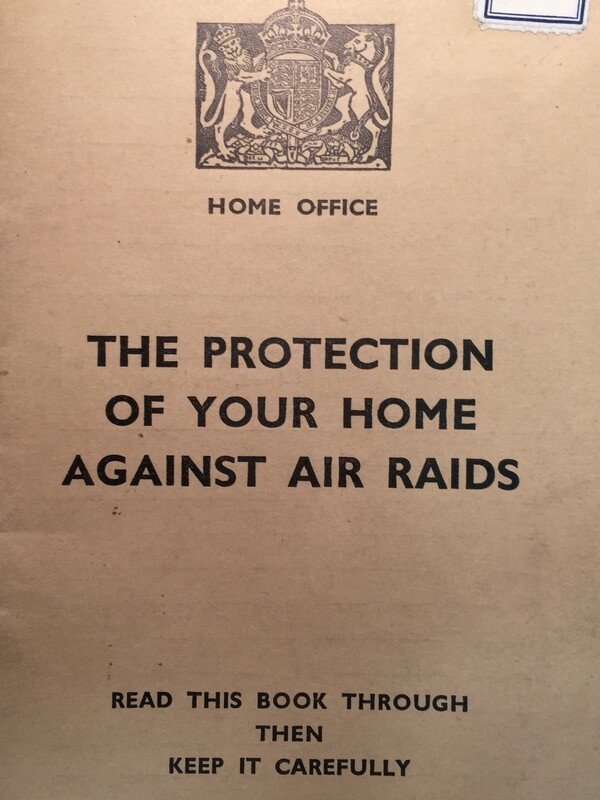 There is a point to the 1938 pamphlet because after the bombing raid, most of what and who was there before is likely to be still there afterwards; not so in a bombing raid in the 1960s. What is the intention of these publications? Ostensibly it is to enable life to carry on for survivors, so the advice is geared towards coping over a longer period. 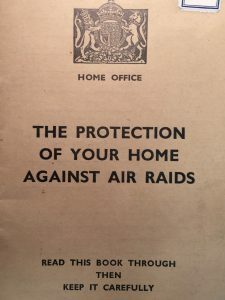 Some of the 1938 guidance re-appears – how to choose your refuge-room (now a “fall-out” room), supplies to have to hand, and so on. But I can see cracks in the guidance appearing on page 8 when it turns to those living in flats and bungalows. “These dwellings give little protection. If you could arrange to join neighbours who live in more substantial buildings you should do so”. It is applying the spirit of the Blitz to a situation that does not resemble the Blitz in any serious way. The final chapter, Life under fall-out conditions, is quite incredible to read. There is no indication as to the reality of life following nuclear holocaust. The instructions, such as they are, assume a level of society and decorum that are impossible to imagine, which is what makes this such a curious read. It mostly feels like a new edition of the 1938 publication, as if hydrogen and atomic bombs were a new edition of cannonballs. You cannot outthink a nuclear attack in the Langdon-Davies sense. 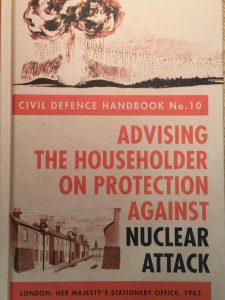 The usefulness of this publication (which is I think at least attractive in terms of design and illustration) is not in its practical advice, but in calming public fears ahead of nuclear war. It isn’t so much a guide for survival as a method of control. Which brings things to the most famous of these kinds of publications, Protect and Survive. 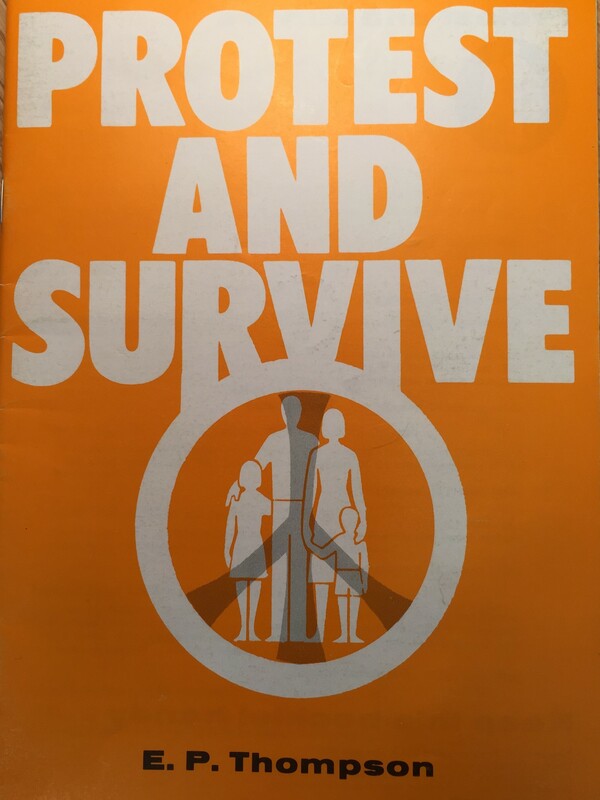 This now iconic publication from 1980 is in many ways just a revised edition of the 1963 publication from HMSO. Line drawings have replaced naïve sketches, and there are a few bits of new advice. For survivors, toilet flushing stops. This is because when you run out of the drinking water that you will have stockpiled, which will not be enough, you will want to start drinking the water in your cistern. Unless radioactive dust has got in it. Boiling does not purify radioactive water. And so on. What is absent from this publication again is any sense of horror. Replacing the kind of questions people might actually face, such as “do I want to live in an unimaginably ruined world” are “Have you remembered to push in any aerial on your radio?” For all its notoriety, the only thing that I find useful in this publication is a picture on page 6, which I will do a separate blog post about at some point. 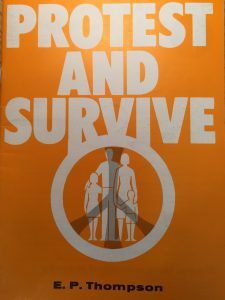 A more interesting read, not least because it is denser in text and because of the range of issues it addresses, is Protest and Survive, a critical response to Protect and Survive, written by the prolific Marxist historian E. P. Thompson and published by CND and the Bertrand Russell Peace Foundation. 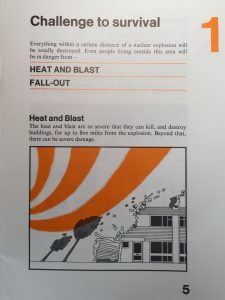 This pamphlet sets the nuclear debate in the political and military context, assessing the opposing arsenals of weaponry, identifying the utterly crucial distinctions between global strategic warfare (and the use of ICBMs) and theatre and tactical warfare (and the importance of cruise missile bases in Europe). 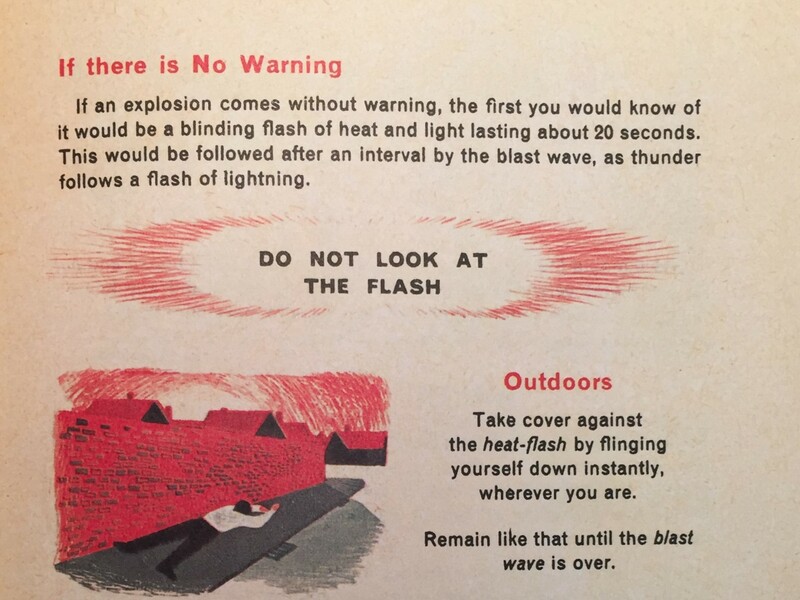 The pamphlet is bleak, reflecting on the experiences of casualties in Hiroshima and Nagasaki, and taking issue with the way in which “othering” people makes it easier to think about annihilating them. 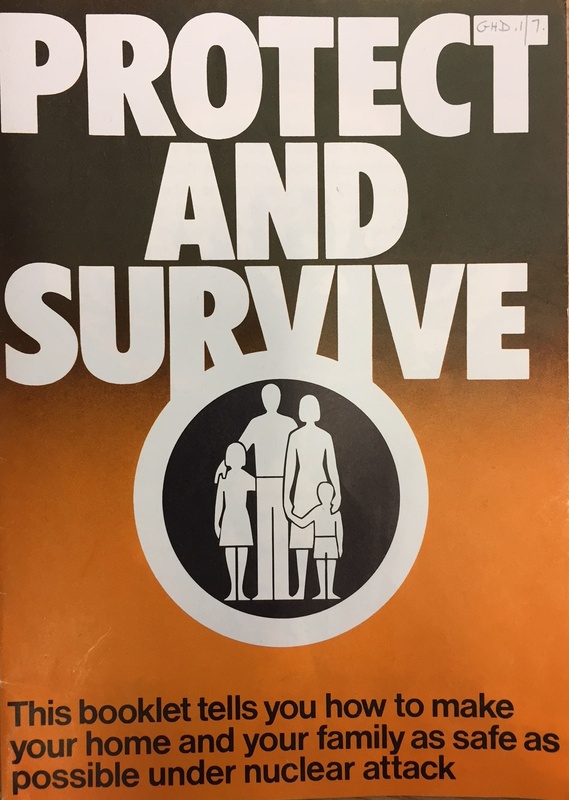 There is some playful work on page 16 where it imagines implementing the advice in Protect and Survive. I found this pamphlet a useful read because of the insight it offered into the way different types of nuclear weapon might be used in different types of war. The TV series Deutschland 83 makes even more sense now. But there is one last publication that is the most useful of all, and that is the Home Office’s 1981 publication Domestic Nuclear Shelters Technical Guidance. 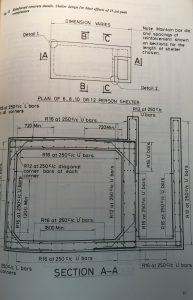 This publication is two things: it provides actually useful information that could help you to build the kind of nuclear shelter that you might stand a half decent chance of living in; and it is a selection process. 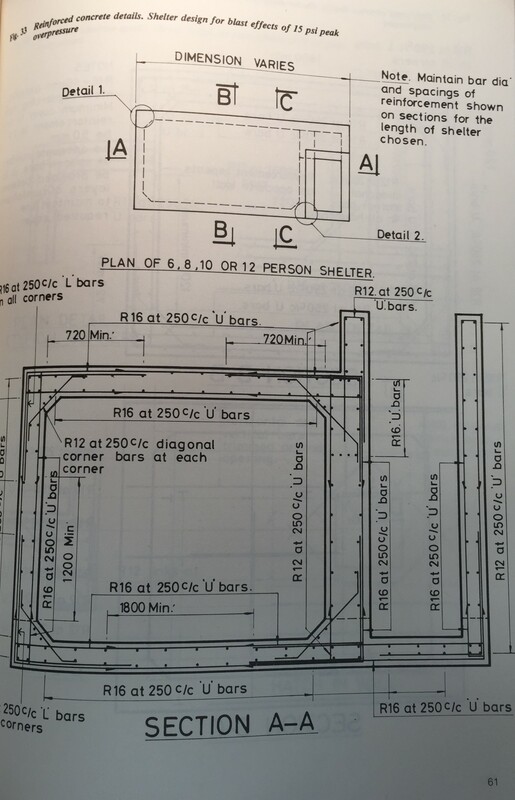 If you are the kind of person who can understand these instructions, and then build the shelter, then you are also the kind of person the country will need when the all-clear sounds. Civil engineers and builders would, presumably, be required for total decades in order to re-make an approximate world. So what are we to make of these publications? Personally, I share the feelings of others: that over and above being largely useless, there is a potential danger in them. 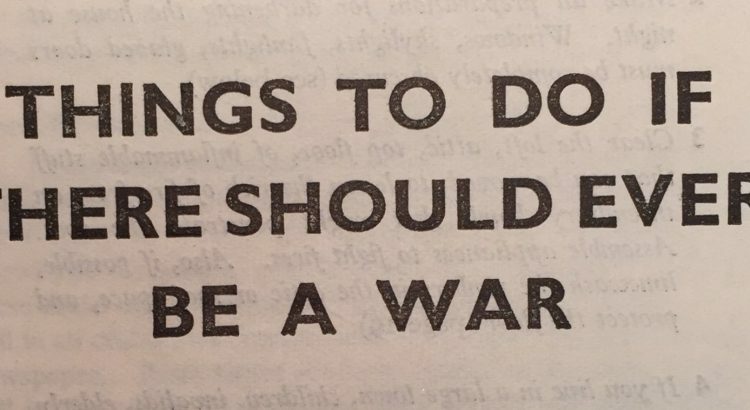 By producing guidance on how to survive nuclear war, do these publications contribute towards normalising it as an idea, that nuclear war is something that we might have a try at? There is no depiction of the possible horrors that we would face for generations such as there is in the 1984 Barry Hines television drama Threads, or the tender personal tragedy that there is in Raymond Briggs’ When the Wind Blows. Rather, there is an attempt to imagine how we could hide in our houses effectively enough so that we could get back to our lives again.